The holidays are in full swing and I’m sure many of you are bringing home your Christmas tree this week! Which inspired me to make this little red pickup truck tree pillow! I use the corner to corner crochet technique and my “throw pillow” turned out to be the size of a standard bed pillow but it is still super cute and functional. You can never have too many cozy christmas pillows! 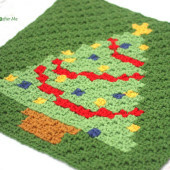 You could also use the graph below and crochet it using SC stitches instead of C2C for a much smaller pillow. Or it doesn’t have to be a pillow at all. I considered making it a wall hanging or even part of blanket. You could easily add a big thick border! I used the corner-to-corner crochet method to make this blanket. Instead of using DC stitches like a traditional C2C, I used HDC. See video below on how to corner-to-corner crochet using the Half Double Crochet! First you will want to download the Pickup Truck Tree Pixel Graph. You can do that HERE. When you are done, it will be reversible! The same image will appear on either side (the truck will just be facing the other direction). If you aren’t familiar with the C2C technique, I have a video class available HERE for purchase that teaches you this technique! The CrochetCrowd also has a very helpful video tutorial for FREE that shows you the basic technique of corner-to-corner crochet. Check that out HERE. JUST ADDED! 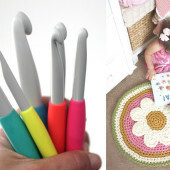 Jenn from Jenn’s Creative Crochet has graciously created the written color change pattern for this project! I know this helps out so many of you who don’t like counting each pixel square. You can get the free downloadable PDF of the written color change pattern HERE. You can follow Jenn’s Creative Crochet HERE on facebook and find her own pixel graph designs HERE in her Etsy shop! ALSO NEWLY ADDED! I forgot to post a second version of this graph! I had come up with two versions originally… one with the tree laying sideways and one with the tree standing up upright. Wanted to pass along this other graph to those that might like it better! Get the Pickup Truck Tree Graph Version #2 HERE. If you are going to make this into a pillow you will need to make another C2C piece the same size as the pickup truck piece but in a solid color (I chose gray). You can follow the blank graph below. No need to add borders! You will simply crochet the two pieces together! Make a SC between each “square” along the edges, chain 2, and SC in the next space. When you get to the corners you will want to make a SC in the corner. See picture below. Insert pillow before completely closing! 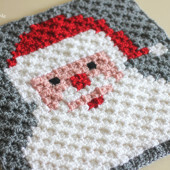 Happy Holidays and Happy Crocheting! I love this pillow! What size is the pillow form that goes inside? What size was yours using the H hook and HDC stitch? Is there a written pattern for the graph? There are written color counts posted now. Awesome! Thanks so much for creating and sharing! You are so welcome. I love working with you . I love your designs. Thank you for including me with this process. Please do the written color changes for her Christmas Character blanket too. I really want to make it too. Help!! 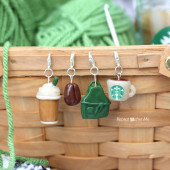 Making this for a gift & trying to finish b4 my grandbaby comes anytime now. Has anyone had problems with the pattern when it reaches line 26?? Seems something is off…this being my 1st C2C I can’t quit figure out how to correct it. Seems the entire line 26 needs to be deleted….also having a problem around the 1st decrease…maybe b/c of line 26 too. I wish there was a way yo contact someone….even going to the sites mentioned, theres nothing. I really hope that Jenn is able to go back and write the written color changes for you Christmas blanket from a couple of years ago. It has been so very helpful for me with this pillow. I feel like I’m getting it done faster than if I were just using the graph. That would make my year because I’d really like to make it. Thanks for this pattern. Can’t wait to finish the pillow. I would like the written directions for this pattern. Your video does not show beginning or end of each row. The pattern is so cute.